EPIC Media Group are pleased to have been working with Norwich City Council and Biffa Municipal to encourage residents to recycle more of their household food waste with a striking recycling campaign on their fleet of new refuse collection vehicles. Chosen from a number of entries the two winning eye-catching designs have been produced and installed ready to hit the streets and increase the amount of food waste collected. 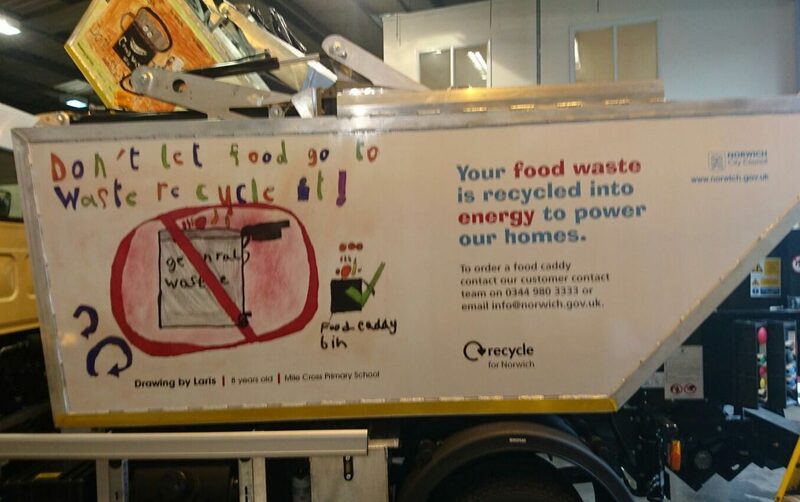 Speaking on the day of the launch, Helen Lambert Environmental Services Team Leader said "Norwich City Council and the winning students at Mile Cross Primary School were delighted with how well the designs look on the new food waste vehicles. EPIC were a great company to work with and were able to offer help and advice when we were looking at our options for the designs". To discuss your vehicle livery please contact EPIC Media today on 01732 897430 or email info@epicmediagroup.co.uk to arrange a free vehicle audit and inspection.